Make the most of the wild salmon and sea trout season with only a few remaining weeks of these wonderful seasonal fish until next year. 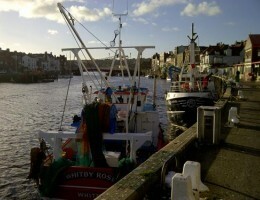 The Wild Salmon and Sea Trout from Whitby are among the best available, our small boats venture out of the pier ends daily to cast their nets for a matter of hours before returning to port with some of the freshest best quality fish available and if were lucky even the odd wild bass and grey mullet! Daily fresh fish and seafood prices emailed to you, just send us your email address requesting your daily fresh fish list. Hygienic polyurethane wall cladding in a brilliant white finish. Two new fridge doors to improve the efficiency of the fridges. A new non-slip resin floor was also added to replace the existing concrete floor in the ‘whole fish fridge’ with plans to replicate in the ‘fillets fridge’ soon.